Grand Central Life & Style, 9781455584710, 512pp. Mario Batali's delicious deep dive into American Regional cooking with 250 recipes--from San Diego Fish Tacos to Boston Cream Pie. All the dishes are very simple and do-able--from Philly Cheesesteaks to Marionberry cobbler. And while Batali uses recipes passed down through the generations, he also shares hints on what he would add to the recipe to take the flavor up a notch. Mario Batali counts 26 restaurants, ten cookbooks, numerous television shows, and three Eataly marketplaces among his ever-expanding empire of Deliciousness. He cookbooks include the James Beard Award winning Molto Italiano: 327 Simple Italian Recipes (2005) and his most recent cookbook, America--Farm to Table. 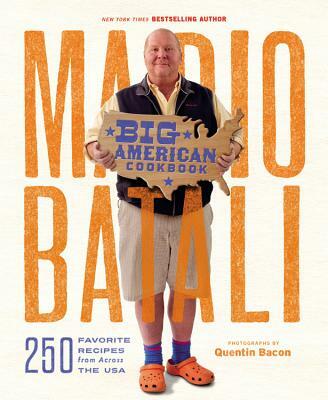 Batali appears daily on ABC's The Chew, a daytime talk show on ABC that celebrates and explores life through food. He and his co-hosts won their first Emmy as Best Talk Show Hosts this year.